Here is another outfit I wore over Easter Weekend. I wore this outfit out on Sunday night and, as with yesterday’s post, I am wearing a few pieces that from last week’s New Stuff post. 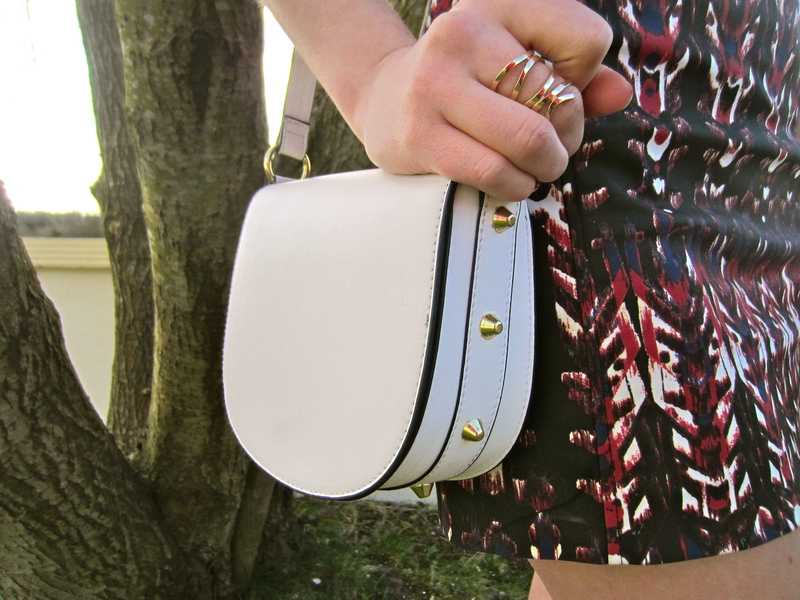 My print skirt, black top and white spike detail handbag are all new and from H&M. As I said in last weeks post, I LOVE this skirt!!!! It just fits like a glove and the colours, the print and the leather trim zip add some really interesting details. This loose black tee is a great basic piece that I am sure I will wear time and time again. I also love the fit of this top and how it drapes. I am kinda sorry now that I didn’t buy it in a few more colours. To finish off this outfit I added black heels from New Look, a ring from Boots and my Michael Kors Sportswatch.